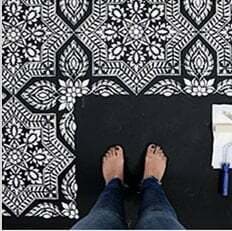 Tile stencils - Stencil your old tile floor to look like cement tiles! Tile stencils are a great find for the thrifty DIY-er! Get that expensive black and white cement tile look for a fraction of the price of real tile. Plus, stenciling a floor or a kitchen backsplash is so much easier than installing cement tile! Our new Abbey tile stencil pattern features built-in registration for easy stencil alignment, and also comes with a free grout line stencil.